Suggested by a novel by Richard and Florence Atwater, Mr. Popper’s Penguins is one of the cleanest and hilarious family movies. I enjoyed it thoroughly, and I was laughing my head off from beginning to end. Jim Carrey is superlative in the role of Mr. Popper, an avid and devoted businessman, who seems to think family is frivolous. As his father was an explorer and almost never came home, Mr. Popper is gauche when building up relationships with his divorced family. However, that all changes when he gets 6 penguins turning up at his doorstep as a parting gift from his father. Janie (Madeline Carroll) and Billy (Maxwell Perry Cotton), Mr. Popper’s children, fall in love with the penguins, as I’m sure you would too. As Mr. Popper turns his home into a wintery, ethereal wonderland, he finally bonds with his kids, realizing family is so much more important than work. The 6 penguins, Bitey, Lovey, Captain, Nimrod, Stinky, and Loudy all have personalities that definitely match their names. Mr. Popper slowly learns to love and hold his children close, just like his penguins loved him. There were many amorous and “aww” moments, and throughout the entire movie, I never felt the urge to walk out of the theater. I think that this is the perfect movie for fathers everywhere to enjoy with their kids. People of all ages will enjoy this film, with the little ones adoring the penguins, older kids relishing the comedy, and adults learning about listening to their children, forgiving others, and leaving the past behind. Mr. Popper’s Penguins is a PICK – priceless and playful movie for all. Mr. Poppers Penguins is a funny and lovable movie. It is about Popper and some penguins that his father has sent to him as a souvenir. When he gets six penguins, he wants to get rid of them. But when his son and daughter who are named Bill and Janie come to his house to celebrate Bill’s birthday, they love the penguins at first sight, and Mr. Popper has no choice, but to keep the penguins. The audience roared with laughter in most of the scenes. I had a good time laughing my head off. But I felt a tug in my heart when the zoo keeper took the penguins away. The most hilarious part in the movie is Popper runs in slow motion and speaking in a slow voice to get everyone’s attention. My favorite part is when Mr. Popper and his family go on a rescue mission to save the penguins from the zoo. 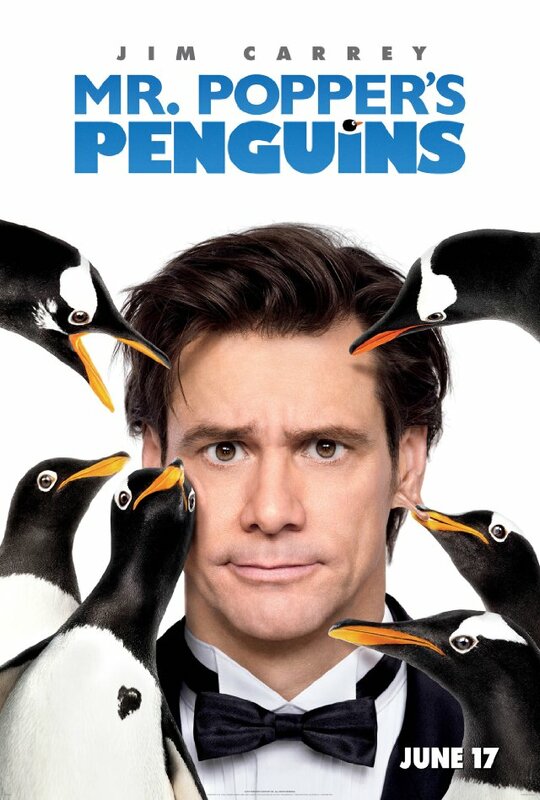 In this movie the cute and lovable penguins all help him finally realize the important things in life. This movie is an excellent, wonderful, stupendous, marvelous and magnificent family movie for all ages. I rate this movie 5 star.